Moon Festival was celebrated in Cambodia on Monday night. This is the same festival as China’s 中秋节 (zhong qiu jie – Mid-Autumn Festival) and there are some overlapping customs. Many Asian countries celebrate this festival, and in fact I saw posts from facebook friends celebrating in four or five different countries. Coming home on Sunday night I saw a few kids playing in our street with small colourful lanterns lit from inside – which gave me a little foreshadowing of Monday’s festivities. On the night of Moon Festival our landlady’s daughter came upstairs to invite my flatmate and I to come down and join them celebrating. From our front door the smell of incense was very strong, accompanied by the giggles and shrieks of children obviously having a good time. Down on the street 25 or more children gathered to play with their lanterns, some barely big enough to carry the smaller lanterns they’d been given. Most were concertina shapes of colourful paper that fold up to expose a small candle. The candle was then lit and the lantern shape folded around it. Many of the ones the children in our street used folded into a globe around the candle, with decorative cardboard pieces to turn the oval shape into the body of an animal – mostly horses, as it is the Year of the Horse. I’d never seen lanterns like these so I was fascinated! Lanterns like this were never part of festival celebrations I observed in Beijing. Our landlady seemed to be the unofficial hostess for the whole street. (You can see her “directing traffic” on the left hand side of the photo above.) 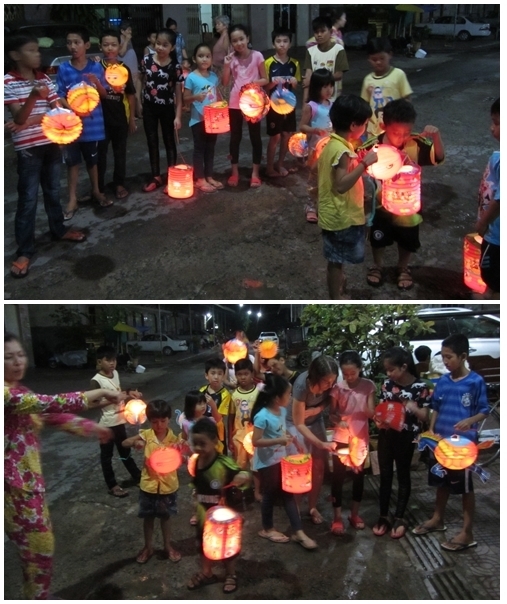 Most of the children gathered outside her house – she hovered around helping light (and re-light) lanterns, and gathering children for a few photos. My flatmate commented that she seems to enjoy playing grandma to the children of the street, though her own kids are too young to give her grandkids of her own yet. At one point she gave a water spray bottle to a toddler and let him shoot it at lanterns – although he seemed to prefer shooting it at himself. Another tradition here is laying out tables of offerings to a family’s ancestors, something I understand is common in many parts of Asia. I don’t recall ever seeing this done so publicly and communally in China. Here many families brought a table outside the home, onto a balcony or the footpath. Tables were covered with white cloths, dotted with candles and sticks of incense, then loaded with all sorts of offerings. There were fresh lotus flowers in water, the petals folded into pretty patterns; some had other fresh or fake flowers as well. There were bowls of fresh fruit – sugar bananas, big bunches of tiny grapes, rambutan, and more. There were boxes of mooncakes – lotus seed paste, or a fruit/nut filling around an egg. There was also a different sort of “cake” – a mixture of flour and sugar pressed into a large disc and embossed with a 3D design; if I understand right, the shape is set by microwaving it until it hardens. There were also large clumps of brightly coloured paper with gold designs that were folded into huge lotus flowers. 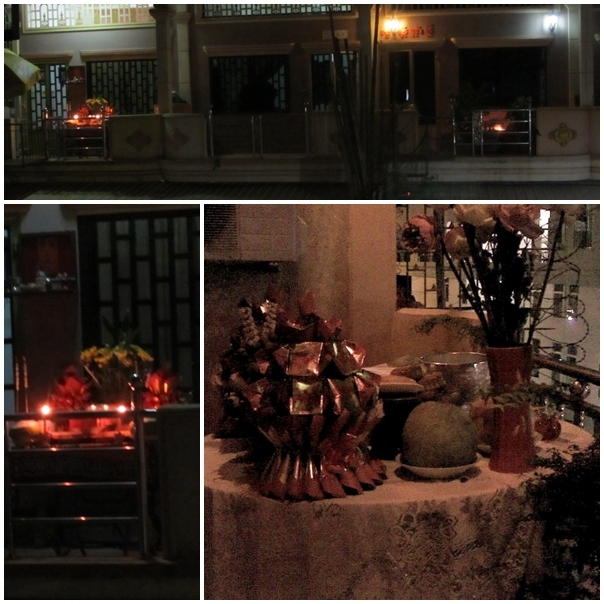 Tables of offerings set up on balconies outside apartments in our street. I take it these paper lotus flowers were made of spirit money, because later they were taken into the street and burned in a mini-bonfire. Several lanterns were added on top, much to the delight of the gathered children. The lanterns, once they caught alight, burned very quickly – often with some coloured flames. I hear in other parts of the city there were also some fireworks set off. Spirit money, by the way, is paper money that is burned as an offering to one’s ancestors. The belief (whether taken seriously or not) is that the burned offerings will reach one’s ancestors in the afterlife. Ancestors must be taken care of firstly out of filial duty and secondly because if they are well taken care of perhaps they will have a positive influence over one’s life. In China I regularly saw people burning spirit offerings on street corners during various folk holidays (such as Tomb Sweeping Day). It’s quite big business – you can buy all sorts of paper possessions to send to the afterlife. There are paper sports cars and luxury brand goods and every iGadget imaginable. I declined an invitation to join our landlady and her family for dinner – I needed some downtime – but it’s something I’ve shared with Chinese friends over the years. I felt made welcome by our landlady’s family, but not pressured to be a big part of things, which was lovely. It was a wonderful introduction to the community I’ve moved into, and the country I’m living in.